CONCLUSION: We argued, based on a comprehensive literature review, that competitive intelligence is an integral practice within strategy that should be explored further for its contribution to emergent and deliberate strategies and the linkage between intra-organisational and extra-organisational activities. We proposed a framework to position competitive intelligence within strategy as practice and in relation to the process view of strategy. The conceptualised framework contributes to the corpus of strategy research as it formalised competitive intelligence as a critical part in the thinking about and the practice of strategy. It moved competitive intelligence from a position on the periphery of strategic management literature, where it was regarded as a mere activity, to an integral practice of strategy to be recognised by strategy scholars and worthy of further research. The field of competitive intelligence attracts the attention of scholars worldwide. Competitive intelligence is regarded as a system of environmental scanning which integrates the knowledge of everyone in a company (Calof & Wright 2008:717). Competitive intelligence has evolved from being traditionally associated with knowledge management and market research (Adidam, Banerjee & Shukla 2012:243; Pellissier & Kruger 2011) to a more generalised discipline that focuses on gathering and analysing intelligence necessary for strategic planning (Adidam et al. 2012:243; Porter 1985). It has furthermore attracted interest for its commercial application as well as its importance as an academic field (Adidam et al. 2012; Calof & Wright 2008). Strategy, on the other hand, is regarded as a 'master concept' within contemporary organisations (Carter, Clegg & Kornberger 2008:85), recognised in business schools where strategy is essential for the 'rite of passage' in becoming a strategist and understanding the essence of the organisation. Carter et al. (2008:87) therefore urge scholars and researchers to engage with strategy in a manner that not only contributes to its corpus, but is also critical and questioning. Strategic management is seen as a subfield within the overarching field of strategy, with a managerial orientation focusing on the sequential process from the inception of a vision and formulation of objectives to the implementation of detailed strategic plans (Shrivastava 1986). Strategy as practice claims a space in strategy research as an emerging approach, one that draws on alternative approaches but also stakes out new ground in joining academics and practitioners (Whittington 1996:731). Strategy as practice shares the strategy research arena with process research (Langley 2007:272). Langley regards it as important to situate process thinking with respect to the subfield of 'strategy process research' and also with respect to the growing 'strategy as practice' movement. Since process cannot be separated from practice (Carter et al. 2008:84), a 'processual view' of strategy as well as the 'strategy as practice' perspective will be adopted for this article. In this regard, strategy process could play out on a continuum of strategising approaches ranging from a rational, deliberate process where formulation and implementation are formalised, to an emergent approach where strategies evolve outside of a formalised process (Maritz 2008; Mintzberg 1994). Whittington (2006:613) calls for a more integrated view on strategy as an intra-organisational as well as extra-organisational activity to advance research from the strategy as practice perspective. In this regard an appeal is made for strategy research to investigate both organisation-specific practices that shape how strategising takes place within organisations (such as routines and operating procedures) and practices that occur on an extra-organisational level (such as industry recipes that guide organisational behaviour from an external perspective) (Whittington 2006:616). The authors make a specific contribution in this regard by studying competitive intelligence for its role in integrating intra- and extra-organisational intelligence through systematic environmental scanning (Calof & Wright 2008:717). The contribution of this article lies in linking competitive intelligence and strategy in such a way that it adds to the corpus of strategy (Carter et al. 2008). We set out to position competitive intelligence within strategy as practice and in relation to the process view of strategy. This integration of two seemingly separate areas of management is important in organisations as it draws attention to the process of strategic decision-making as both competitive intelligence and strategy focus on conceiving an actionable strategic plan that could lead the organisation to improved performance (Adidam et al. 2012; Porter 1985; Rouach & Santi 2001). Strategy as practice as an emergent research approach within the field of strategy focuses not only on strategy as an academic construct but also on the practice of strategy and general application of strategy in business (Whittington 1996). The same is true for competitive intelligence, which has wide commercial applicability with a strong practitioners' focus (Global Intelligence Alliance 2007). As such we explain the relationship between strategy as practice (with its emphasis on the process of strategy) and competitive intelligence, which should illuminate the marriage between practice and academic research as well as afford competitive intelligence its rightful place as critical practice inside strategy and not on the periphery. Despite the seeming similarities between the field of competitive intelligence and the field of strategy (especially with regard to strategy formation/strategising), surprisingly few studies have explicitly examined this relationship - a gap that this article addresses. This article will also show that competitive intelligence is an integrating practice that unites the bifurcation between intra- and extra-organisational activities. To achieve the purpose of this article, a comprehensive literature review making use of thematic content analysis and focusing on competitive intelligence and strategy is presented. Following the literature review, our methodology is described. We conclude with discussions on our findings, our proposed framework, and conclusion and limitations, which include some recommendations on possible future research. Similar to many new study fields where coalescence around the domain and scope has not occurred, there are numerous definitions of competitive intelligence. It would seem that there is no commonly accepted term for referring to internal and external intelligence required for business decision-making. Market (or marketing) intelligence, competitive intelligence, business intelligence and other terms are all used at various times to describe more or less the same concept (Venter & Tustin 2009:89). According to Campos, Rubio and Quintero (2014), strategic intelligence is used to manage risks in the external environment as an early warning to management. Pellissier and Nenzhelele (2013) define competitive intelligence as the gathering of actionable information about the competitive environment for decision-making. It can be regarded as a system for environmental scanning that integrates the knowledge of all organisational members and encompasses marketing, structural, strategic and other organisational elements (Calof & Wright 2008:717). Within this system there are very specific activities at play, namely the gathering, analysing and distributing of intelligence for the development of an effective business strategy (Du Toit 2015). Xu, Liao and Song (2011) take this definition further by focusing on the role of management as strategic decision-makers to whom the competitive intelligence practitioners should communicate competitive intelligence that was gathered from various sources, analysed and interpreted. The concept has been studied under various labels since 1960 (Adidam et al. 2012:243). Since then, several publications, including books and academic articles, have been published on marketing intelligence (Adidam et al. 2012; Solberg Søilen 2010). The term 'environmental scanning', which focused on how executives 'scan' their organisation's environment, has been used as part of the research on marketing intelligence and market research (Adidam et al. 2012:243; Calof & Wright 2008). Another such label was that of 'competitor analysis', associated with Porter (1985). Competitive intelligence was seen to focus on the gathering of competitive data to be used for decision-making (Begg & Du Toit 2007; David 2011; Fatti & Du Toit 2013; Kalinowski & Maag 2012; Kühn 2012; Pellissier & Kruger 2011; Saayman et al. 2008; Strain 2013). It is clear from literature that competitive intelligence has grown in prominence since the early 1980s and a number of works on competitive intelligence have appeared, suggesting that competitive intelligence is a separate function in an organisation and a separate subject field (Fleisher & Bensoussan 2007; Kühn 2012). Competitive intelligence has developed as a distinct field, and the activities have come to serve all business functions (Adidam et al. 2012:243). Porter (1980) reported that while companies were carrying this activity out informally, in his opinion this was nowhere near sufficient. He advocated the need for a structured intelligence process in order to continuously and systematically identify business opportunities and threats. Porter's work on strategic management and competitiveness created the background for the development of competitive intelligence as a subject field (Porter 1990; Viviers, Saayman & Muller 2005b:578). This is especially important for the emergence of competitive intelligence as a generalised subject field that can contribute to the expansion of the field of strategy as a critical decision-making function within the organisation (Adidam et al. 2012:243; Carter et al. 2008; Sewdass & Du Toit 2014). During the 1990s, competitive intelligence's growth was fast paced, but areas such as competitive analysis and its dissemination received less attention than others (Du Toit & Muller 2005:321). The works of Campos et al. (2014), Kühn (2012), and Pellissier and Kruger (2011) emphasised the role of competitive intelligence as a system of activities within strategic management focused on providing actionable intelligence for management decision-making. Research highlighted that individual departments do not share information as part of the strategy formation process within the broader strategic management process (Calof, Marcoux & Robinson 2010; David 2011; Kalinowski & Maag 2012). This view regards strategic management and competitive intelligence as two separate concepts that are competing for prominence in the organisation. In this article, the authors suggest that competitive intelligence should be seen as an integrative practice within strategy as practice. Some research has the business organisation at centre stage and considers competitive intelligence from the perspective of strategic management (Cuyvers et al. 2008; Saayman et al. 2008). This vein of research focuses specifically on the tasks of a strategic manager to ensure that an organisation achieves a competitive advantage. Cuyvers et al. (2008:85) and Saayman et al. (2008:384) see competitive intelligence as synonymous with business intelligence. According to these authors, competitive intelligence emanates from competitors, customers, suppliers, technologies, environmental intelligence and potential business relationships. This line of research regards competitive intelligence as a critical activity in formulating a strategy that is based on actionable intelligence, but its role as an overarching practice that integrates micro-level activities is not investigated (Cuyvers et al. 2008; Saayman et al. 2008). Competitive intelligence is mostly seen by these authors as a tool in knowledge management and business intelligence and as such is regarded as an activity of tactical nature instead of a strategic practice. Some authors make a case for the integration between intra-organisational intelligence and extra-organisational intelligence emanating from the social structures of the industry in which the organisation is embedded. The focus in these articles is on the influence of external environmental changes on the competitiveness of the organisation and the need to integrate external environmental information with internal business information for planning purposes (Begg & Du Toit 2007; Calof et al. 2010). This vein of research provides insight into the integrating role of competitive intelligence between extra-organisational and intra-organisational activities but does not explicitly delineate this relationship (Fahey 2007). It does suggest, however, a greater role for competitive intelligence to integrate the strategy process and enhance the practice of strategy. The research presented in this article serves to highlight the importance of competitive intelligence, not only as an activity within the business functions but as a practice that integrates a variety of activities and contributes to a well-informed, insightful, future-oriented strategy in a significant way. Our research will show that competitive intelligence enhances the strategy process, not only as a set of separate activities but also as a practice within systematic strategy-making that integrates individual activities. 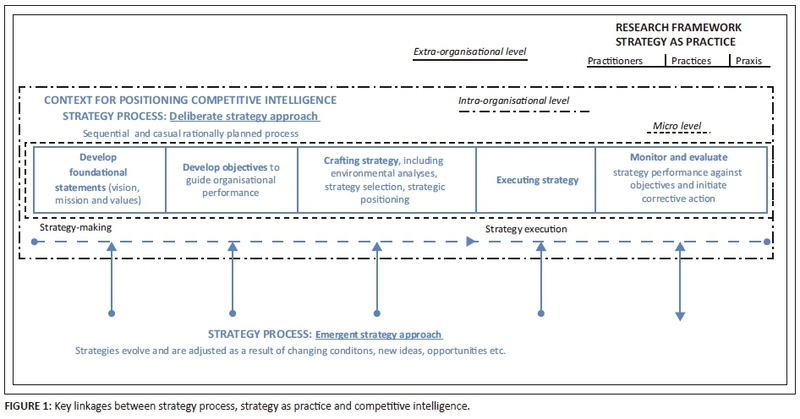 This article will furthermore focus on competitive intelligence from a strategy as practice perspective and will not regard competitive intelligence as an isolated system of environmental scanning, but rather as a high-level strategic practice integrating the strategy process through activities relating to the gathering and interpreting of intelligence from both intra- and extra-organisational sources. However, the article will provide a new perspective not previously discussed in competitive intelligence articles, namely the relationship between competitive intelligence and the practice of strategy. The marriage between process and practice in this research fills a research gap, contributes to the strategy as practice research domain (Langley 2007:272) and contributes to the research agenda in terms of taking a more integrated view on competitive intelligence as an intra- and extra-organisational practice (Whittington 2006:613). The above definition is especially important to this study for the reference to 'intended and emergent' initiatives in the process of strategising. The reference to the internal resources and initiatives/activities as a way to enhance organisational performance within external environments is also important as our research suggests that competitive intelligence plays an integrative role in this regard. Research in strategy has traditionally been divided into the content and process tradition (Furrer, Thomas & Goussevskaia 2007; Hilse & Nicolai 2004:372). Content research concerns itself with the linkage between performance and market position, resource provision and a host of organisational attributes. Process research, on the other hand, examines the sequential strategic management process, planning methods as well as the traditional strategic management cycle (Lechner & Mueller-Stewens 2002). From the processual perspective, strategy research is essentially concerned with choice processes (strategic decision-making) and implementation processes (strategic change) (Pettigrew, Ferlie & McKee 1992). In academic literature, strategy process plays out in a dichotomy of processes of which one extreme is the deliberate planning or rational approach to strategising and the other is the emergent approach to strategising (Brews & Hunt 1999; Mintzberg 1985, 1994; Pretorius & Maritz 2011:25). Pettigrew et al. (1992:17) describe strategy in terms of process that does not unfold according to 'neat logic' of the more traditional economic strategy research associated with scholars such as Ansoff (1965, 1994) with his seminal work on strategic management (Clegg, Kornberger & Pitsis 2011:137). Here it is important to highlight the distinction between emergent and deliberate processes. Deliberate process is concerned with a rational process of strategy formulation, implementation and evaluation associated with strategy design, positioning and analysis (Mintzberg 1994; Porter 1980; Pretorius & Maritz 2011:25). The emergent approach to strategy is associated with integration between formulation and implementation, where the two phases are not necessarily separated and strategies evolve from day-to-day business activities (Brews & Hunt 1999; Mintzberg 1994; Pretorius & Maritz 2011:25). According to Farjoun (2007:198), organisations should base their strategies on emergent strategy (Mintzberg 1994) and simple rules rather than on the more deliberate, structural approach comprising the positioning model and the resource-based view (Porter 1980) in order to stay more dynamic and be flexible to adjust to required change in their markets. The deliberate approach has been institutionalised in academia and business and remains the dominant approach to strategic thinking - scan the environment, assess your strengths and weaknesses, formulate the strategy, and then go on to secure its implementation (Kay, McKiernan & Faulkner 2006). However, this approach has been challenged for its inflexibility and its inability (unlike the emergent approach) to incorporate learning into the strategy process and adjust to dynamic industries (Liedtka 2001). Szulanski, Porac and Doz (2005:xiii) attribute the 'enduring scholarly interest in the process of strategy making' to 'the abiding assumption that some ways of strategizing are more efficacious than others, and thus lead to higher firm performance in the long run; higher than luck alone would bring'. It is therefore not surprising that 'the quest to uncover stable principles of good strategy making has attracted much support of interest over the years' (Szulanski et al. 2005:xiii). Finally, strategy as practice has grown as a research field with a new emphasis on organisational theory and strategic management (Vaara & Durand 2012). Strategy as practice has more recent origins, emerging out of a reaction against prevailing assumptions of economic rationality (Johnson et al. 2007; Johnson, Melin & Whittington 2003; Suddaby, Seidl & Lê 2013:330). These economic views of strategic planning depict an idealised 'rational actor myth' of strategic decision-making without fully attending to the complex and often convoluted day-to-day processes of decision-making or decision-makers (Jarzabkowski, Balogun & Seidl 2007). The emergence of strategy as practice is in line with the more processual understanding of organisation and management (Suddaby et al. 2013:331). In order to provide an analytical framework in which competitive intelligence can fit as part of strategy, the authors focus on the work of scholars who suggest understanding strategy as a practice and process. Strategy as practice provides further analyses of micro- and everyday activities that constitute the 'labour of strategy' (Clegg et al. 2011:137; Jarzabkowski 2004), focusing on praxis, practitioners and practices (Jarzabkowski et al. 2007; Whittington 2006). Strategy as practice literature tends to use the verb (strategising) rather than noun (strategy). Langley (2007:275) is of the opinion that changing strategy, the noun, into strategising, the verb, reflects the emphasis on a process within strategy as practice research. Movement is thus added to a relatively static concept that is linked to the action of sense-giving and sense-making of strategy (Rouleau 2005). This heralds a shift in focus to participation on micro-organisational level and how participants take part in activities that contribute to strategising. Praxis refers to the sheer labour of strategy, the flow of activities such as meeting, calculating, investigating and presenting through which strategy is made. Practices involve the various routines, discourses, concepts and technologies through which this strategy labour is made possible - not only those that form part of strategy reviews, but also those embedded in consulting tools (Porter's analysis, hypothesis testing, etc.) and in more material artefacts (PowerPoint, flip-charts, etc.). The key strategic practices are the formal operating procedures involved in the direction setting, resource allocation, and monitoring and control (Jarzabkowski 2003:23). Strategy practitioners are defined widely to include both those directly involved in making strategy (managers and consultants) and those with indirect influence (policy-makers, media, business schools who shape legitimate praxis and practitioners) (Jarzabkowski & Wittington 2008:101). Whittington (2006:620) explains that practices play out on many levels. At one level, practices might be organisation-specific, embodied in the routines, operating procedures and cultures that shape how strategising takes place in the organisation. However, practices can occur on an extra-organisational level as well. These are practices that derive from the larger social fields or systems in which an organisation is embedded (such as appropriate strategic behaviour set by industry recipes). At a still higher level, there are practices of whole societies - societal practices that inform norms of appropriate strategic scale, structure, scope and inform legitimate ways of developing strategy. This is where competitive intelligence as a system of environmental scanning which integrates the knowledge of everyone in the organisation (Calof & Wright 2008:717) and involves activities of competitor analysis (Ghoshal & Westney 1991) could play an integrative role by bringing together extra-organisational and intra-organisational intelligence to inform actionable strategies. Research in the field of strategic management has evolved from a sole focus on process (Langley 2007) to the micro-organisational focus of strategy as practice (Jarzabkowski 2003; Johnson et al. 2007). It is clear from the literature that strategy as practice cannot be divorced from the process of strategy (Farjoun 2007; Johnson et al. 2007; Langley 2007). Langley (2007:273) refers to process as the elephant in the room, meaning that process cannot be ignored within the practice perspective. It is also important to situate strategy as practice within the subfield of strategy process research. The article expands on this research by situating competitive intelligence within the overlap of strategy practice and strategy process research. It does this in order to provide a theoretical frame for positioning competitive intelligence and seeking a logical and meaningful place for competitive intelligence within the strategy research field, emphasising its rightful role in the strategy domain. From the above account of research in the field of strategy, the following key linkages with competitive intelligence become clear (Figure 1). The focus on strategy process provides a contextual structure within which competitive intelligence can be positioned. Competitive intelligence activities are not depicted separately in this figure as it will be organised and specifically linked to themes and topics in the content analysis of the extended literature review. Research has focused on a sequential and causal process of decision-making (Dameron & Torset 2014). Competitive intelligence research has likewise emphasised the value of competitive activities for strategic decision-making, although not explicitly relating it to the strategic management process, suggesting a key linkage (Begg & Du Toit 2007; David 2011; Fatti & Du Toit 2013; Kalinowski & Maag 2012; Kühn 2012; Pellissier & Kruger 2011; Saayman et al. 2008; Strain 2013). In Figure 1, the deliberate strategy has been illustrated as a sequential step-by-step process organised according to strategy-making and execution. As part of strategy process, the continuum of emergent and deliberate approaches to strategising provides further structure to our eventual analysis. Where the emergent strategy relies more on current contextual competitive intelligence to evolve, the deliberate strategy uses competitive intelligence in a neat, logical process of strategic exploration (Brews & Hunt 1999; Mintzberg 1994; Pretorius & Maritz 2011). In Figure 1, the emergent process is depicted below and the influence of evolving strategies on every step of the deliberate process is indicated by arrows. Strategy as practice provides the framing context for competitive intelligence with its focus on micro-organisational practices and praxis. It is also significant that practices can play out on extra- and intra-organisational levels (Whittington 2006). In Figure 1, the strategy as practice research lens is illustrated as the context within which the strategy processes are situated and which informs the activities contextually. The extra-organisational level is shown as surrounding the organisational strategy processes and the intra-organisational level is indicated by means of a patterned line. This level functions within the organisational environment. Finally, the belief that strategy can lead to higher performance levels (Szulanki et al. 2005) makes the significance of linking competitive intelligence to strategy all the more evident. The research question can be formulated as follows: What is the position of competitive intelligence within the field of strategy? To answer the research question, the authors employed a thematic content analysis based on an extended literature review. Thematic content analysis is described as an independent qualitative descriptive approach and as a 'method for identifying, analysing and reporting patterns (themes) within data' (Braun & Clarke 2006:76). Thematic analysis involves searching across data, in this case research publications, to find repeated patterns of meaning (Braun & Clarke 2006:80). In this instance, the authors conducted the analysis to position well-researched and well-known competitive intelligence activities within the strategy as practice research paradigm as well as within the well-established process of strategic management. The authors set out to discover overarching themes that correspond with the process of strategic management and can be categorised as either praxis or practices within the framework of strategy as practice. The authors examined peer-reviewed strategic management and competitive intelligence articles in the database ABI/Inform published between 2004 and 2016 and considered the following terms: business as strategy, business intelligence, competitive intelligence, competitor intelligence, marketing intelligence, strategic intelligence, strategic management, strategy as practice and technological intelligence. These terms were published in the title, abstract or subject fields of ABI/Inform. The authors focused on publications published between 2004 and 2016, to ensure research impact, noting Cooper and Schindler's (2014) guideline that at least five years' research should be used for representative analysis. Publications reporting on the content of strategic management, strategy as practice or competitive intelligence. Publications reporting on the practices (activities) of strategic management, strategy as practice or competitive intelligence. Publications reporting on what strategic managers or competitive intelligence professionals do. Publications reporting on practitioners of strategy or competitive intelligence. Publications reporting on the origin/evolution/future of the concepts strategic management, strategy as practice or competitive intelligence. During the organisation of data phase, the authors analysed the documents and focused on conceptualisation where theories, models and concepts were explored (Leedy & Ormrod 2013). Main issues explored in the articles were grouped. These concepts were written down, connected with lines, grouped, regrouped and explained. Specific competitive intelligence topics emerged. The topics were also evaluated for their contribution to either the deliberate strategising approach or the emergent strategising approach. The authors then critically discussed and interpreted the topics that emerged, explored the themes for representativeness and subsequently evaluated the positioning of the themes within strategy as practice and the process of strategy (Elo et al. 2014:5). These topics were then grouped into overarching themes and organised according to the strategic process steps as depicted by Kay et al. (2006) and strategy as practice, with higher-level practices and associated lower-level praxis. The final phase of our thematic content analysis was focused on deducing meaning from the themes that emerged by evaluating them within the context of strategy as practice and the strategic process. The focus was on developing a framework to position competitive intelligence within the strategy as practice and process theory. An integrated framework was also compiled, illustrating the integration of competitive intelligence with strategy as practice in the process of strategising. The framework and findings are discussed in more detail below. When reviewing the literature on competitive intelligence, it became apparent that some authors assume that competitive intelligence is a means of strategic management to improve competitiveness (De Pelsmacker et al. 2005; Du Toit 2013:31; Pellissier & Kruger 2011). Different competencies are required for various competitive intelligence roles and responsibilities (Du Toit 2013; Pellissier & Kruger 2011; Strauss & Du Toit 2010a, 2010b). Strauss and Du Toit (2010a) only looked at the competitive skills necessary to enhance South African competitiveness and Pellissier and Kruger (2011) focused only on competitive intelligence as a strategic function. Dameron and Torset (2014:297) identified sharing of strategic intelligence as one of the codes emerging from interviews that they conducted with 69 strategists in organisations, which suggest the critical link between competitive intelligence and strategising. We have noted, in line with Whittington's (2006:620) explanation of integrating practices, that strategic practices exist on multiple levels, including organisation-specific and extra-organisational levels. Competitive intelligence occupies a special and significant place within the practice turn of strategy as it is embedded in extra-organisational as well as intra-organisational practices. In applying content analysis to these strategic management and competitive intelligence publications studied, certain themes relating to strategic management and competitive intelligence practices or praxis emerged. The competitive intelligence activities and routines are organised according to typical strategic management phases of formulation and implementation (Carpenter & Sanders 2014; Kay et al. 2006). During the strategic planning cycle, practices associated with the formal operating procedures are key, such as direction setting, resource allocation and monitoring and control. These are not the only practices from which strategic action evolves but are 'theoretically valid' within the strategic management literature and innately practical and concerned with strategising (Jarzabkowski 2003:23). The dominant competitive intelligence activities emanating from the literature were initially organised into 12 topics (praxis). The authors further combined these topics into seven overarching themes that correspond with the typical strategy process portrayed in literature and also with higher-level strategy practices (Jarzabkowski 2003; Kay et al. 2006). The initial topics were similar to the activities/praxis included in the competitive intelligence cycle. The competitive intelligence cycle is described by the Competitive Intelligence Association (CIA) as '… the process by which raw information is acquired, gathered, transmitted, evaluated, analysed and made available as finished intelligence for managers to use in decision-making and action' (Johnson 2012). This confirmed to the authors that the topics are relevant and in line with prevailing literature on competitive intelligence. 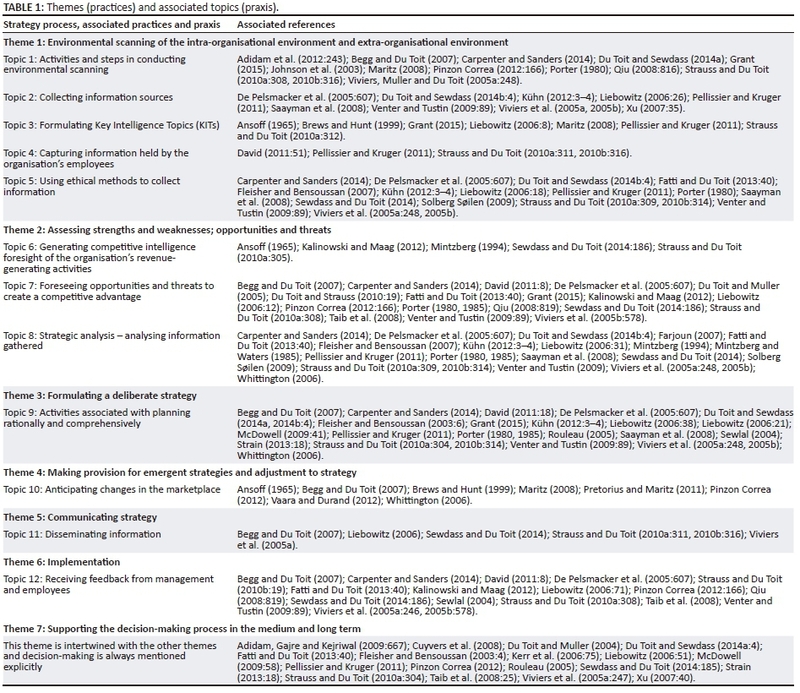 The following table provides a depiction of the connectedness of the themes (practices) and topics (praxis) as well as the linkages with strategy process and strategy as practice. The topics (praxis) were linked together to form overarching themes (practices). The themes that emerged can be strongly linked to a step in the typical strategy process (Kay et al. 2006) and confirms the sound relationship between strategy process and competitive intelligence. An explanation of the overarching themes and associated topics derived from the thematic content analysis follows below Table 1. This is the enveloping practice of conducting internal and external analyses and environmental scanning. Environmental scanning typically includes competitor analysis and industry analysis as practices. Practitioners are typically competitive intelligence analysts, and employees knowledgeable on the external and organisational environment. Environmental scanning is associated with systematic analysis as part of a deliberate strategy. It is clear from the extended literature review and subsequent content analysis that this theme is well developed within the competitive intelligence research field. A consequent classification of research along the vein of activities grouped in topics below is evident from the literature. The praxis includes activities of executing environmental scanning, gathering information and analysing information. The praxis associated is the collection of information sources. This activity ties in with the broader practice of information gathering as part of environmental scanning. Practitioners are competitive intelligence practitioners and employees knowledgeable on the external macro-, market and organisational environment. This is a praxis that can be regarded as an activity within the practice of environmental scanning. The praxis involves the determination of intelligence needs as determined by internal clients. The practitioners are typically competitive intelligence practitioners. When this praxis is focused at aligning intelligence needs with strategic objectives, this is associated with the deliberate strategy where specific ends and means are formulated. This could be applicable to the formulation as well as implementation phase. In the latter, a process of scrutinising strategy documents and conversations to determine intelligence needs is typically adopted. The deliberate process would be built on the foundation of routinely and diligently perusing and extracting intelligence to determine strategic positioning in the market. Ansoff (1965) linked strategy to planning and believed that strategy is the selection of a single course of action. Brews and Hunt (1999) discussed the nature and purpose of planning, while Grant (2015) discussed how companies plan ahead. Pellissier and Kruger (2011) investigated strategic management in the South African insurance industry and recommended that companies use information systems to generate intelligence. According to these authors, business intelligence, competitive intelligence and knowledge management all form part of strategic intelligence, although business intelligence is usually seen as information significant to the business activities of an enterprise. This activity is a typical praxis performed by the data capturers as practitioners. It is a lower-level strategy activity and could be associated with the strategy process or practices of sense-making. This is one of the key topics in the competitive intelligence literature and is associated with the praxis of collecting information. This in turn forms part of the broader practice of environmental scanning. The practitioners are typically competitive intelligence practitioners and employees that are knowledgeable about the industry and organisational environment and that are involved in environmental analysis. This is a practice that could be associated with the application of the strengths, weaknesses, opportunities, and threats (SWOT) analysis and systematic analysis of information in the internal and external environment. The practitioners will typically be competitive intelligence analysts as well as strategy and market specialists. Analysis is associated with the deliberate strategy, especially the formulation phase, where a strategy is based on systematic application of analysis tools and techniques. However, this could also be associated with emergent strategising where analysis forms part of a more fluid process but still fosters a mutual understanding of strategic issues and eventually leads to strategic intent. This praxis is linked to the process of assessing the internal strengths and weaknesses. Financial analyses are conducted based on the organisation's income and expenses. Typical analyses include ratio analysis and comprehensive analysis of financial statements. The practitioners are typically employees skilled in finance, marketing and strategy. Forecasting based on financial information and analysis is strongly associated with the deliberate strategy. This praxis involves systematic gathering and interpretation of data. Practitioners are typically strategy consultants or competitive intelligence practitioners. This praxis includes the interpretation of information, which falls within the broader practice of strategic analysis, where information gathered in an ethical manner from a variety of external and internal sources is analysed using various tools and techniques. The practitioners are analysts, competitive intelligence practitioners or strategy specialists. Analysis is associated with the deliberate strategy. Themes 3 to 6 seem to have been less well-structured in the literature, although sufficiently covered in research to warrant the combination into themes. That is the reason for topics not being well demarcated and a classification not being as clear as with the preceding themes. This offers a research opportunity in strategy to investigate why less emphasis is placed on competitive intelligence in the formulation of deliberate and emergent strategies, communication and implementation. The literature showed an overall interest in these themes but without the in-depth organisation evident in Themes 1 and 2. Through combined competitive intelligence praxis and practices of gathering, capturing and analysing information, competitive intelligence serves as an input into the strategy process and strategising. It is also an intricate practice of direction setting, enabling sense-making and strategising within the organisation. The practice of competitive intelligence is used to determine strategic outcomes and priorities. This is a formalised process with sequential steps, such as setting the vision, objectives and selecting strategies (Grant 2015). Practitioners include strategists, consultants or managers. This is typically linked to the deliberate strategy process. All competitive intelligence activities and routines culminate in planning. Competitive intelligence is inextricably linked to strategising and the process of strategic planning. Practitioners are strategists, consultants, managers or competitive intelligence practitioners. This practice is a comprehensive process of forecasting or simulating probable or possible changes in the marketplace based on a series of observations or analyses and making strategic decisions on reacting to those changes. The practitioners are typically strategists, managers from a variety of organisational functions and top management. The practices stem from a societal focus and from the interplay between intra- and extra-organisational stimuli. Forecasting is associated with the deliberate strategy, while reacting to changes and adapting strategy to changes in the marketplace is associated with a more flexible emergent strategy. The praxis is one of individual organisational members reacting to changes that emanate from the external environment and adjusting their routine activities to suit changed market conditions. This practice is associated with the discourse around competitive intelligence gathered and communicated, for example workshops. The practice of communicating the strategy and making it explicit in the organisation is typically associated with deliberate strategy. This is also strongly associated with the final step in formulation of strategy and communicating the well-formulated strategy to operationalise the objectives. This practice is also critical in documenting the deliberate strategy process and final strategy. This praxis is that of communicating strategic issues relating to strategising through various media. Another praxis is the interpretation of information to decide what the priorities are and what should be communicated. Any organisational member could be a practitioner involved in communicating information in a host of possible forums. The dissemination of information is associated with both the emergent and deliberate strategising approaches. Emergent strategising requires discourse on strategy-related issues to establish strategic intent and strategic thinking, which benefits the emergent approach to strategising. The final practice in the strategy process is the implementation of a deliberate strategy. This theme also includes references to monitoring and evaluation as the final step in the deliberate strategy process. Literature on the emergent strategy refutes the idea of separate phases of implementation and formulation and argues that strategy may often be operationalised while it is still in the decision-making phase (Mintzberg 1994). However, the practice of implementation is well documented in literature and includes various praxis, such as developing lower-level objectives and implementation frameworks (Kay et al. 2006). This topic covers a variety of praxis, such as inviting feedback on the strategy, structuring feedback mechanisms and recording feedback from different levels of management and lower-level employees. This step typically completes the competitive intelligence loop. Practitioners are employees from all levels of the organisation, including managers. Feedback practice forms part of the implementation phase of a strategy, and more specifically the evaluation of the implemented strategy. Feedback can also be less formalised and would then lead to an emergent strategy, which is adjusted as internal or external circumstances dictate. This theme, which is focused on competitive intelligence in decision-making, spans all six other themes as all of the preceding themes and topics involve strategic decision-making. Literature regards decision-making as an entwined process that has an impact on each of the other themes. This is an iterative practice associated with the competitive intelligence process of sourcing information, analysing information and applying information in making strategic decisions. Decision-making is an inevitable part of strategising and sense-making in both the deliberate strategy and the emergent strategy approach. All organisational members involved in any of the associated praxis can be regarded as practitioners. The content analysis linked strategic management and particularly strategy as practice and process view with competitive intelligence activities. Competitive intelligence is a critical integrating practice within strategy. The framework (Figure 2) shows the overlapping area between strategy as master concept and competitive intelligence. The area of competitive intelligence that does not overlap with strategy is the area where competitive intelligence is specifically linked with fields such as marketing or knowledge management. The overlapping area between the two fields of research clearly plays out in both the process of strategy and the practice of strategy. The topics that were identified as the first level of coding in the thematic content analysis could be clearly identified as praxis. These are routine activities associated with the labour of strategy (Jarzabkowski 2003:23). When the topics were logically grouped, the themes that emerged showed clear characteristics of the typical deliberate strategy process, but also the emergent strategy process (Kay et al. 2006). Theme 4 is particularly associated with the emergent strategy since adjustment to the environment would favour a more flexible strategy that makes provision for strategic intent and strategic thinking (Liedtka 2001). According to Whittington (2006), intra- and extra-organisational practices involve linking the internal organisational environment with that of the external environment in which the organisation is embedded. It is clear from the themes that emerged that Themes 1, 2, 4 and 6 could play out in both the intra- and extra-organisational environments. These themes are shaded to indicate the integrating nature of the practices. Competitive intelligence embodies seven themes that are all associated with the strategy process. These themes form practices that encompass both choice and implementation (Pettigrew et al. 1992). As these practices span both intra- and extra-organisational activities, competitive intelligence can be seen as an integrating practice (Whittington 2006). It is not only a selection of praxis that entails tactical activities but embodies logical overarching practices of a strategic nature. Our research has shown that competitive intelligence is an overarching strategic practice that integrates all the associated strategic practices and praxis. Competitive intelligence is critical for both emergent and deliberate strategies and is associated with rational planning as part of the deliberate strategising process, but can be regarded as a critical practice to ensure emergence of strategy. Integration of these two approaches is critical for strategic alignment (that is, the fit between an organisation's strategic priorities and its environment) (Walter et al. 2013:305). 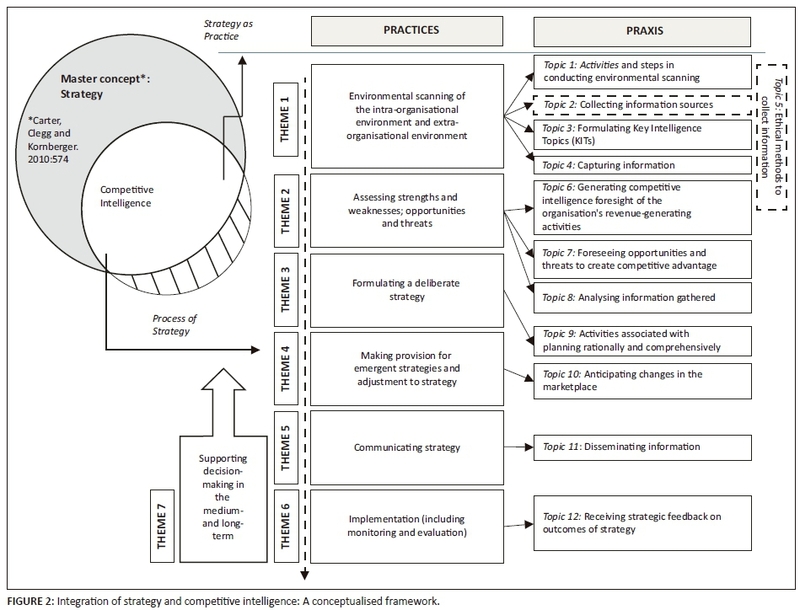 Figure 2 shows that competitive intelligence is not merely an isolated activity or sequence of tasks, but binds together various praxis on the lower level, which in turn unite in higher-level practices within strategy. Competitive intelligence seems to link, as an integrating higher-level strategic practice, various practices and praxis. It informs the strategy process at various phases of the process and is associated with critical micro-organisational practices that integrate strategic decision-making at the external and internal organisational level. This research set out to review articles and books published on strategy and competitive intelligence to determine their respective contents in order to answer our research question, namely: What is the position of competitive intelligence within the field of strategy? We conducted a thematic content analysis based on an extended literature review. This article demonstrates that strategy and competitive intelligence are inextricably interwoven and organised in the process and practice perspective. Competitive intelligence is shown not merely to be an activity or sequence of activities within the broader strategic management process, but to be a significant strategic practice. The findings of the thematic content analysis crystallised into seven competitive intelligence themes. These themes were discussed in relation to the strategy as practice perspective as well as the deliberate and emergent process views. This was depicted in a framework that links competitive intelligence to strategy process and practice. It was illustrated that there are areas of competitive intelligence that are less well-defined than others, based on the well-defined topics within each of the themes. The dominant focus in existing competitive intelligence literature seems to be on competitive intelligence as an activity on the periphery of strategy. It became clear that most research focuses on competitive intelligence activities as part of environmental scanning, analysis and decision-making (Themes 1, 2 and 7) and less on the eminent positioning of competitive intelligence within strategy development, communication, implementation, monitoring and evaluation (Themes 3 to 6). This opens up opportunities for research in the field of strategy to investigate why less emphasis is placed on competitive intelligence in the formulation of deliberate and emergent strategies, communication and implementation. Our research has highlighted the need for the elevation of competitive intelligence as an area of research interest and more specifically as an overarching strategic practice. This may play a role in practice, where competitive intelligence can be used to supplement and enhance strategising and not only be seen as a supporting and peripheral activity. We conclude on the basis of the content analysis that competitive intelligence is an overarching practice encompassing various key activities (praxis). Strategy as practice provides a positioning framework for competitive intelligence that shows its significance as integrative practice, integrating extra-organisational and intra-organisational activities within both formulation and implementation phases and within emergent strategy as well as deliberate strategy. Strategy as practice shares the strategy research arena with process research (Langley 2007:272). Langley regards it as important to situate process thinking with respect to the subfield of 'strategy process research' and also with respect to the growing 'strategy as practice' movement. This article contributes to the strategy as practice field by adding the processual view as a combined research perspective. Vaara and Durand (2012:251) challenge strategy scholars to be mindful of the variety of practices, not only to be able to more effectively analyse major societal issues but also to be able to better understand the challenges of their solution. According to Vaara and Durand (2012) researchers should focus on how strategising is enabled and constrained by prevailing strategic and organisational practices as this would reflect real-life practices that are institutionalised. This perspective is in line with strategy as practice research which emphasises the importance of current strategic practices informing theory (Tsoukas 2010; Vaara & Whittington 2012). This would inevitably lead to a more nuanced understanding of the agency of strategy or strategising that enables the practitioners of strategy through a combination of practices. This demonstrates the importance of developing a framework for the practice of competitive intelligence within the master concept of strategy. Whittington (2006) implores researchers to understand the origins of practices, which have been illustrated in this article. Competitive intelligence can be regarded as a legitimate integrated practice that links intra-organisational and extra-organisational levels of strategy. As such, competitive intelligence offers a way for all managers to be included in strategy, which is not always the case (Balogun & Johnson 2004; Davis, Jansen van Rensburg & Venter 2014a, 2014b; Whittington 2006). Traditional strategy research focused on the role of top managers and in particular the CEO in making strategic decisions (Ansoff 1965). However, the focus of strategy as practice is on the middle manager as the critical link between operational staff and managerial staff - the latter typically makes the strategic decisions and the former implements the strategies (Davis et al. 2014b; Whittington 2006). This embeddedness in the structure of organisations and the body of research and education as a societal practice emphasises the importance of competitive intelligence within strategy (Whittington 2006), also from a practical point of view. Seidl and Whittington (2014:3) argue that the practice perspective conceptualises strategy as 'field of knowledge and power', which defines the real problems in organisations and the parameters of the real solutions to them. It therefore empowers other actors in the strategising arena (Knight & Morgan 1991). We have shown that competitive intelligence can be used from a practice perspective to enlighten organisational members in terms of strategising. This provides a further research opportunity for exploring actual competitive intelligence practices and solutions at micro-organisational level in more depth and to explore these from a practice perspective. If competitive intelligence is developed and incorporated into the formal strategising process, management can make better decisions. Competitive intelligence has evolved as a critical strategic practice benefitting both the deliberate strategising process and the emergent strategising process. Competitive intelligence has been institutionalised as a significant overarching and high-level strategic practice with associated lower-level practices and praxis in organisations. This is important as a societal practice that is shaped and legitimised through tertiary education courses. In this sense management will benefit from further research and the development of competitive intelligence as integrating practice. Some limitations to the study should be noted. These include methodological limitations. According to Braun and Clarke (2006:97), thematic content analysis is a flexible method that allows for a wide range of analytic options, which means that the potential range of conclusions about the data can be broad. While this is an advantage, it can also be a disadvantage in that it makes developing specific guidelines for higher-phase analysis difficult and can be potentially paralysing to the researchers trying to decide which aspects of their data to focus on. Our study has been aided in this regard by the use of strategy as process and practice as a research lens. A further disadvantage is that thematic analysis has limited interpretative power beyond mere description. However, in this study the theoretical framework assisted in interpretation, albeit to a limited extent. Future research can investigate the practice of competitive intelligence in strategy empirically to explore the relationship in more detail. It should be pointed out that this study was only exploratory in nature, and, as such, the findings cannot be generalised. The systematic review of the literature demonstrated that competitive intelligence is a very relevant and current field within strategy as practice that should be explored further for its contribution to emergent or deliberate strategies. Further research could be conducted on the application of competitive intelligence practices in the organisation and their influence on the strategy of the organisation. Case study research could be conducted to explore the field and add more depth and breadth to the study and add to the corpus of strategy as practice research. A first draft of the manuscript was developed by both authors, who each researched their respective areas of literature, namely the competitive intelligence by A.d.T. and the strategy by R.M. Both authors conducted the thematic content analysis, crystallised findings and conclusions and developed the integrating model. Subsequent refinement and changes to the first draft were made by R.M. due to A.d.T. 's retirement as a result of prolonged illness.